Earlier rumours, concerning the 3GB version of the Nvidia GeForce GTX 1060 graphics card, look like they were right. There had previously been talk about the Nvidia GeForce GTX 1060 3GB offering cut down specifications, beyond the headlining amount of fitted memory. As is the case with such early information, things were rather unclear, sources were dubious, and others thought the cut down specs may be representative of a GTX 1050 card, or just plain wrong. 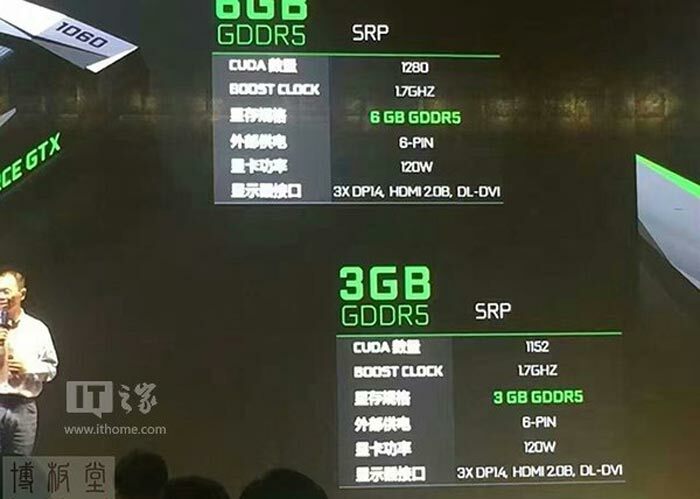 Now information has come to light from an Nvidia event in China that makes the differences between the Nvidia GeForce GTX 1060 6GB and 3GB versions very clear. The cards are identical apart from the obvious graphics RAM fitted (evident in their names) and that the cheaper card will have fewer CUDA cores. Describing this difference in more detail; the 6GB card had 1,280 CUDA cores spread across 10 streaming multiprocessors, the 3GB card has 1,152 CUDA cores across 9 streaming multiprocessors. Thus the number of texture mapping units is also reduced from 80 to 72. Elsewhere, as you can see from the slides, the 3GB variant is a match to its 6GB big brother in specifications and component speeds. The spec reduction exercise is obviously Nvidia designing the 3GB variant for its proposed $199 price point. Such a price will pit it right into the centre of AMD's RX480 and RX 470 lineup. It won't be so long until this 3GB variant becomes available, with AIC partner made models starting to emerge in September, says the source. Ridiculous, and almost disingenuous, to cause confusion like that. AMD were bad enough with slower memory on 4GB 480 models, but at least the change was related to memory which was already a product differentiator. 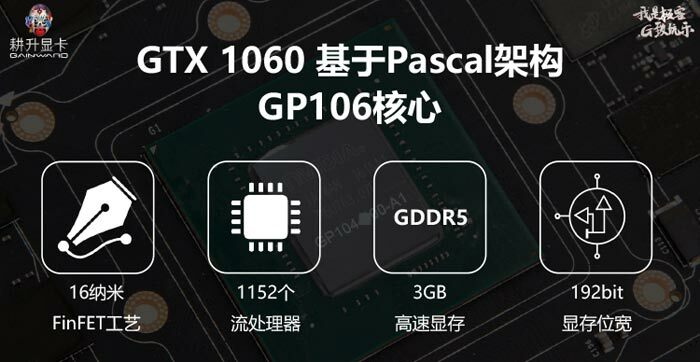 I'd say it's more than just disingenuous, it's dishonest and fraudulent, using the same model name to describe two distinctly different specifications of GPU core is being done with the intention of misleading people, it should be called a 1050 not a 1060 3GB. Fraudulent? Only if they claim it has 1280 shaders when it doesn't - and that's not the case here. Misleading? Only if there was a widespread expectation that the model number of a graphics card guaranteed a particular specification, and that's never been the case (take the GTX 460, for instance, or the many many lower end cards that nvidia served with multiple different architectures). You'd have to be a very naive customer to assume that a GTX 1060 3GB and a GTX 1060 6GB were otherwise identical. One thing we all know is that the average consumer will be swayed by bigger numbers. So the average consumer will automatically assume that the GTX 1060 6GB is better than the GTX 1060 3GB. In this case they'd be more right than usual, and at least they haven't released a card with more memory but clocked slower, which is the usual trick (4GB R7 240s, for instance, that have DDR3 memory). No … while I think the difference could be made clearer by nvidia, I'm actually going to give them a bye on this one. The average person will assume that the 3GB card is slower than the 6GB card anyway. It's unclear, but I don't think it's particularly misleading. We're going to have to disagree then as personally i see this as Nvidia intending to deceive, they're trying to persuaded your average consumer that the two cards are the same sans the RAM.